Fabulous six bedroom detached residence on approximately 1.5 acres of private mature landscaped gardens. 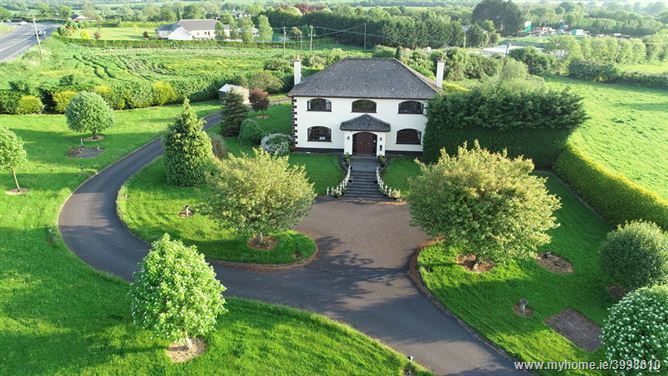 The current owners had ran the property as a successful guest house for many years due to its location on the busy N2 Slane to Navan road and close proximity to the historical Slane Castle, Newgrange Heritage Centre and The Boyne Valley. Accommodation briefly comprises reception hallway, sitting room, sun room, TV room/bedroom, kitchen/living area, dining room and five large bedrooms all with en suites. There is also a double garage attached to the property which has been converted to an apartment. Whilst currently lived in the accommodation will require some modernisation. The property is located approximately 2kms south of Slane on the N2 and approximately 20 minutes from the towns of Navan, Drogheda and Ashbourne and 40 minutes from Dublin city centre Viewing comes highly recommended. Approximately 1.5 acres of mature landscaped garden. Heating - Oil Fired Central Heating.